CVR Energy and its subsidiary partnerships seem to be benefiting from a budding special relationship with the incoming administration. 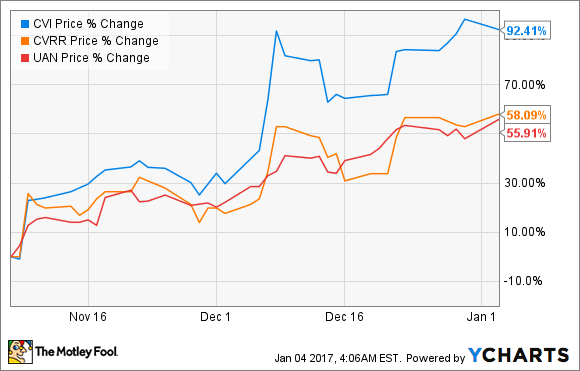 Shares of CVR Energy (NYSE:CVI) and its two subsidiary partnerships, CVR Refining (NYSE:CVRR) and CVR Partners (NYSE:UAN), all saw big double-digit gains in December. Many other refining stocks did as well, but CVR's performance was notable based on one particular aspect. 2016 wasn't exactly a great year for CVR Energy or its subsidiaries. For the refining arm of the business, rising oil prices meant the price spread between crude oil and refined products narrowed significantly, which ate into CVR Refining's profitability. There was also the fact that CVR's costs for complying with the U.S. Environmental Protection Agency's renewable fuels standards were abnormally high, something that CEO Jack Lipinski made sure everyone knew about on the company's recent conference calls. CVR Partners' business of manufacturing nitrogen-based fertilizers wasn't exactly firing on all cylinders, either. The price of urea hit 12-year lows of $177 per ton in June. As a result, both partnerships halted distributions to preserve cash. This is significant for CVR Energy because its sky-high dividend is supported by those distributions. Without them, the company has been forced to use its own cash on hand to keep payments to shareholders up. Recently, though, we have seen a bit of a turnaround. Urea prices are now up over $200 a ton, and the price of gasoline is starting to catch up to the rise in crude prices. This doesn't wholly explain the situation, however, because these three companies did noticeably better than most other refiners and fertilizer producers this past month. The other key factor to consider here is the majority shareholder of CVR Energy, Carl Icahn. Currently, Icahn's private investing company Icahn Capital LP owns 82% of all shares outstanding in CVR Energy. Yes, that is the same Carl Icahn who has been nominated by President-elect Donald Trump to a position he's calling a special advisor on regulatory reform. And, yes, that is the same Carl Icahn who has repeatedly railed on the EPA for its renewable fuels regulations. So it probably shouldn't come as a shock to see that shares of all three corporate entities have had a field day in the market since Trump was elected. Before investors get too excited over the idea of buying a refiner that may get the opportunity to pick and choose how to reform regulations that currently impact its business, let's keep in mind the fundamentals of the oil refining and nitrogen fertilizer markets. As long as crude oil prices keep climbing, refining margins are likely going to remain low even if or when we see major changes to ethanol blending requirements. In fact, management even announced in its most recent conference call that it was looking to retain some cash in the coming quarters for maintenance capital and major turnaround work at its facilities. Also, we're still working through a bit of an oversupply in the nitrogen fertilizer market as cheap natural gas-fueled facilities are taking market share. These things suggest that we may not see very robust results from CVR Refining or CVR Partners in the coming quarters, and that will continue to put a dent in CVR Energy's cash reserves. Investors may be excited today, but they may be less optimistic in the coming quarters.